Pop stars love proposals during their concerts. Whether it's One Direction helping with an engagement, or Justin Timberlake bringing two lovebirds to the stage, romance is in the air whenever incredibly catchy love songs are played at high volume. The latest case of pop star meets proposal is a bit different though. Demi Lovato got engaged to a five-year-old boy during her show in Illinois on Saturday and, if I'm being real, she kinda forced him into it. He gave her a ring and she gave him an embarrassing video that will haunt him forever. The love story began when Lovato saw a picture of five-year-old Grant online (presumably right before the concert began...?) holding a sign that read, "I have a ring for you." So in the middle of her performance, Lovato called Grant up to the stage along with his poster and the ring he had crafted for her out of green pipe cleaners. Lovato told Grant, "I think, since you're up here, no we should make it official," and explains to him how to propose. The crowd goes wild when he gets down on one knee and, after Lovato's prompting, repeats after her the big question. Um... The fact that he didn't propose on his own speaks volumes. Dude wasn't trying to get married, he just enjoys making pipe cleaner rings and wanted to share his handiwork with his favorite singer. Jeez, Demi. Way to force a guy into a commitment! But seriously, the thing that most stuck with me when watching the video is that Grant will now have to endure this ridiculous video at every birthday party, family reunion, and major life event that he goes through. Hell, his mom will probably show this to his first girlfriend, who will be majorly confused about his real age considering the entire thing looks straight out of the '80s. 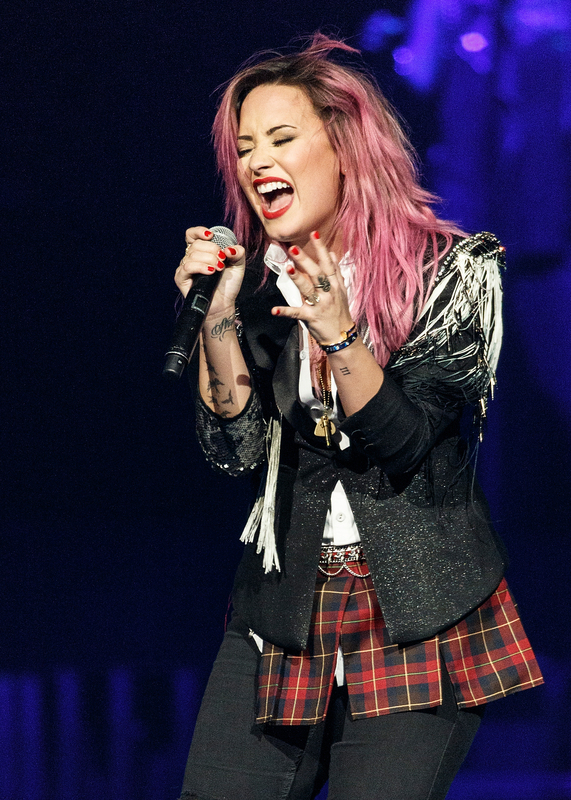 The kid is wearing red pants and a stonewash denim jacket and I don't know what on earth is up with Demi Lovato's concert-wear. She looks like the second coming of Paula Abdul. Which, perhaps, is just what she was going for. I'm sure Grant is back home now, hopefully, due to children's short memory spans, not pestering his parents about when he'll get to see his fiancée again. And, also hopefully, not witnessing his mother sending this video to everyone she knows and giggling about it on the phone right in front of him. Poor, Grant.